vast and wonderful country. Like Brokaw's greatest generation, they did what needed to be done. 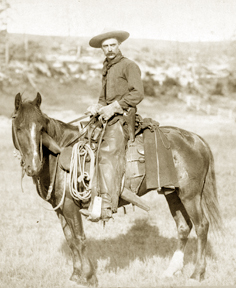 The cowboy above, photographed by John Grabill near Sturgis, South Dakota in the 1880s, could just as easily have been photographed this morning. Virtually nothing has changed - or has needed changing - in over 100 years. Below, cowboys take a noontime break near the Belle Fourche river. To listen to the author speaking about this book on Public Radio, click here.